With more than 50 years in the cigar, pipe and tobacco business, we have established the industry connections necessary to bring you the best premium quality cigars, quality pipes and quality tobaccos at reasonable prices and some of the best service north of Boston and worldwide on the web. We have recently remodeled our store in order to bring you more than 100 premium handmade cigar brands with more than 425 sizes to choose from in stock. In addition to remodeling, we have also expanded. We now have the upstairs pipe room completely dedicated to the fine art of pipe smoking. We carry a wide selection of imported cigarettes and tobaccos from around the world. 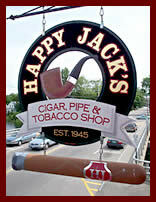 Happy Jack's Cigar, Pipe and Tobacco Shop is a family-owned and operated full-service tobacconist serving New Hampshire and now the world. Owners Peter Jr. and Peter Sr. enjoy a smoke shortly after the renovation project was completed.